I am not sure yet whether I can attend Tuesday’s meeting or not. In any case. I will not be able to stay the whole 3 hours. As I have been a frequent attendee of the transportation theme group, I wanted to register some things I believe are still missing from our theme group’s output. (I am somewhat spatially challenged and do not find the grid presentation easy to follow, so forgive me if I am missing something). attendees to say that we consider the needs of private car travel well represented elsewhere, and we feel that relying on that mode of travel is neither sustainable or desirable. And that therefore we need to place particular emphasis on bicycle, pedestrian, and public transit. There has been one vocal member of our group supporting private car use, and she does believe it to be desirable and sustainable. Since she speaks for a good-sized swath of our population, even a majority, this dissenting view should be mentioned. Further, I want to go on record as opposing a “high density, transit-friendly 86 corridor” at this time. I have a lot of distrust of the current development ethos and do not have any confidence that any semblance of the rural buffer can be maintained if we begin to erode the rules and regs in place at this time. I propose closing off less-frequented residential streets to through traffic, and allow access only to bicycles, pedestrians and vehicles of residents of that particular street. Bike lanes are touted as necessary to get more folks out of cars and onto bikes. But even if the Town connects all the currently unconnected segments of roadway which have bike lanes, they will still be too unsafe for most people. it will cost even more than traditional bike lanes, but to make the roads safe for cyclists, bikes must be physically separated from cars. Canada provides a model – in many cities they have erected plastic bollards where we use white paint, as a separator. Can the Town try this in a single location, as a test? I want to raise a topic that merits discussion by your group: the routes and technology of intracity transit plans. This is particularly relevant because the County may soon decide to put a transit tax on the ballot to fund transit projects in Orange County. What will that tax fund? Highest on the priority list appears to be the link between Durham and Chapel Hill, which would join a rail link beginning in northern Raleigh, traveling to Cary, RTP, Durham and then Chapel Hill. My questions is this our highest need? What about Highway 54 congestion? A consultant to the MPO said this north south public transit link would not alleviated congestion there. Should we invest big bucks in a fixed rail system that would not directly serve Carolina North or many Chapel Hill commercial centers? Below is an excerpt from a letter I sent to Council. I commend you for conducting long-range planning with other jurisdictions for efficient public transit. However, I would prefer the Council not lock itself into the “local preferred alternative for the light rail alignment” for Chapel Hill as proposed tonight by staff. It would be better to keep open the possibility of an upgraded bus system using roads. Such a “best bus” system would join Durham and Chapel Hill without the high costs of building a fixed guideway. This so called “transit system management system” or “best bus” as referred to by the professionals, is simply an upgraded bus system without the expense of a guideway that could serve Durham and Chapel Hill and points in between. I propose you keep this more flexible option open and on the table because the funds for the proposed staff fixed guideway option are not certain and could be years away. 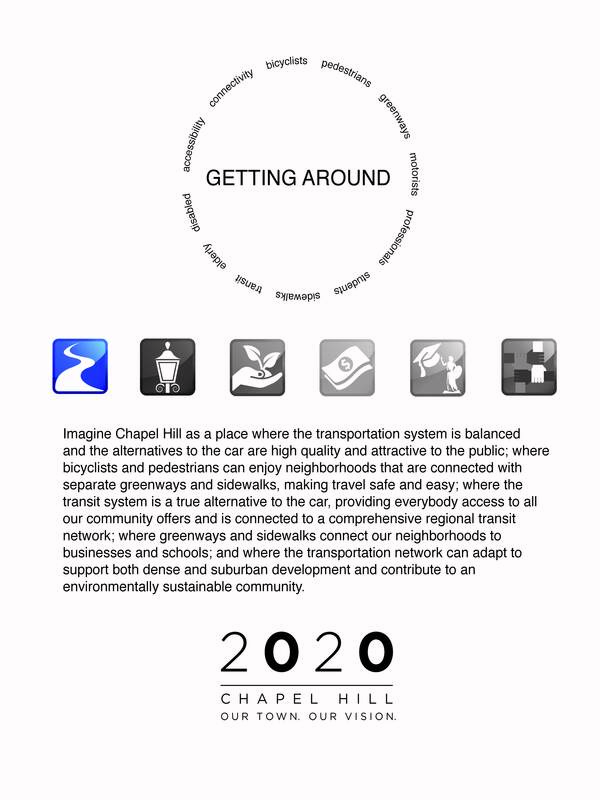 Wouldn’t we rather put our transit dollars toward a system that would serve Carolina North and other commercial centers in Chapel Hill as well? The present high priced fixed guideway proposal links Durham destinations with Meadowmont and UNC Hospitals, while missing most of our commercial centers. If asked to help to fund such a transit system through an additional transit tax, which route and which technology would Orange County voters favor? I agree with many of the comments I read in the meeting minutes. I would also like to add that one of the big barriers to increasing walking and bicycling are the lack of continuous sidewalks and good lighting in many older neighborhoods and the lack of off-street bike paths. We live near Franklin Street and several greenways but find ourselves driving for even short errands because of safety concerns. The lack of contiguous off-street bike paths also prevents our family from biking for errands and leisure and taking greater advantage of parks and greenways. I know retrofitting neighborhoods for sidewalks is very costly, but without giving residents better access to existing sidewalks and greenways from their homes, few people will ever take advantage of any new pedestrian and cycling infrastructure. Thanks for the opportunity to provide feedback!